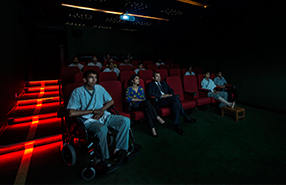 Our state-of-the-art movie lounge is a perfect chill out spot where you can choose to enjoy a blockbuster movie in a comfortable setting, while you wait for your appointment. The facility has been designed with great sensitivity, keeping in mind the anxiety and stress that patients and their families undergo. It is a great initiative by the Institute to offer world-class care to its patients and their caregivers.